There are probably 40 or 50 customers in, but that feels remarkably quiet by the standards of this pub. Good to see a near-full beer range available. Elland - White Prussian 3.90 This was genuinely excellent. A really good, light, hoppy beer. In here after work when still quite busy, but the crowds had melted away by 8:30. Maxim - Azacca Pale 4.30 Pale gold. Very nice hop flavours from Azacca and Cascade. Rudgate - Green Hop Monster 4.00 Golden and with a creamy texture. Interesting hop flavours. Bitter finish. Inveralmond - Daracha 5.20 A dark beer which has drawn a lot of flavour from a period in wooden barrels. Theakston - Pink Grapefuit Ale 3.90 Pale gold. Not unpleasant but oddly soapy with hints of boiled sweets as well as hops and fruit. Tolerably busy – I even found a free table. Some sort of card school going on, with many tables occupied by players. Great Newsome - Frothingham Best Bitter 4.30 A good quality, chestnut-coloured, traditional Best Bitter. Nice to come in here and be served quickly at the bar and have a choice of tables at which to sit. Caledonian - Baird Beer Rising Sun Pale Ale 5.50 A pretty decent, golden beer. 16:25 Down to seven of us and my last stop of the day. Yet another first for me. Magnificent building, but the crowd. Weltons - Snow Lay Roundabout 4.20 All seven of us had this. Vile, all you could taste was phenol. Changed without question. A bit of an error coming in here at 6:30, the absolute peak of the after-work crush, and it took an age to be served. But it soon quietened down a little. Banks's - Central City Red Racer IPA 6.50 Fabulous US-style IPA. I’d been searching for this one and it fully lived up to, exceeded even, expectations. Titanic - 7 C's 5.00 Amber in colour. An excellent, if perhaps slightly unsubtle beer that is full of ‘C’ hops. Oakleaf (now see Fallen Acorn entries) - 10 Little Acorns 4.40 An amber-coloured beer described as being a Mild. Toffee and biscuit flavours. Pleasant. Cotleigh - Redfire 4.80 A bit too ‘Red’ for me. Adnams - Sixpoint Bengali (previously Bengali Tiger) 6.40 Not Tried This one quickly ran out. Intolerably busy in the early evening and I almost give up trying to get served, but persevere for one. Moments later my friend Jeff arrives but he decides not to even try. Many more beers were available. Wadworth - Ishii Brewing Minagof Smoked Porter 5.50 Black. Lots of roasted malt and peaty smoke. Worth the wait to get served. I am such a scatter-brain sometimes. Did I remember tonight to go to the Dispensary in Aldgate to help my friend Mick celebrate his birthday? No. And did I remember to go to Ye Olde Mitre to help wish Scotty and Kathy a happy retirement? No. I just randomly came in here on my own for a quiet one on the way home from work. Adnams - Mateo & Bernabé Birra Armada 4.80 Amber-coloured and very nice. White Horse - Tap (Tenth Anniversary Pale Ale) 4.60 A balanced Pale Ale. Tasted quite dry and a bit spicy – but this may just be the comparison with the odd beer that went before. Gemstone (brewed on Nelson plant) - Diamond IPA 5.00 Amber-coloured. Oddly sweet and then sour. Not right. I’ve seen this pub very busy before, but never quite so crowded as it was in the early evening tonight. By the time I left it was difficult to push through to the exit doors, and outside there was a long queue of people waiting to get in with staff operating a ‘one in one out’ policy. No doubt they were all here to try the Small World Brewery selection. Small World Beers - Long Moor Pale 3.90 Pale, bitter and well-hopped. Small World Beers - Thunderbridge Stout 5.20 A rich, black Stout. Lunchtime visit through to the afternoon, a crowd of enjoyed a few pints each. Personally I was disappointed to see that although there was a large number of beers available, the number of brewers represented was fairly small. Camerons - Strongarm 4.00 Sweeter than I remember it. 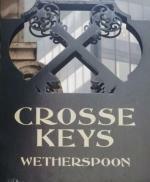 The pub is found in City, Central London, EC3V 0DR. 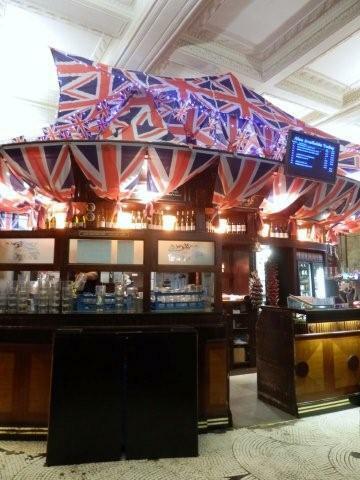 Big and busy JDW pub in the heart of the City in Gracechurch Street. Huge sports screen on one wall. Wonderful building with lots of high ceilings and marble. The lights in particular are worth noting. Oval bar towards the rear serves numerous handpumps (I saw 18) including guest beers not on the JDW usual guest list. This is definitely worth coming to if you are in the City during the week. We have visited this pub 89 times, seen 401 different beers and tried 181 of them.